Welcome to the updated iearn.org! Where iearn.org and collaborate.iearn.org have been merged into one single website. The look has been refreshed, and we've reorganized some elements to help ease the user experience. Outlined below are a few of the key changes. Please take a look, and let us know what you think. We're eager to hear your feedback! Previously, in order to log in to the Collaboration Centre, you would visit collaborate.iearn.org and enter your login credentials in the right hand sidebar. Now, the login bar is fixed in the iearn.org header, so you can log in from any page in the iearn.org website! You can now access the Collaboration Centre by visiting the "Collaboration" tab. From there, you'll be able to view Featured Collaboration Centre Projects, access popular Collaboration Centre Spaces (such as the Teacher Forum, Youth Forum, and Learning Circles), and review key resources for using and participating in the Collaboration Centre. Get all your iEARN News in one place! iEARN news used to be found in the "News" Section at collaborate.iearn.org, as well as the "News" Section at iearn.org. 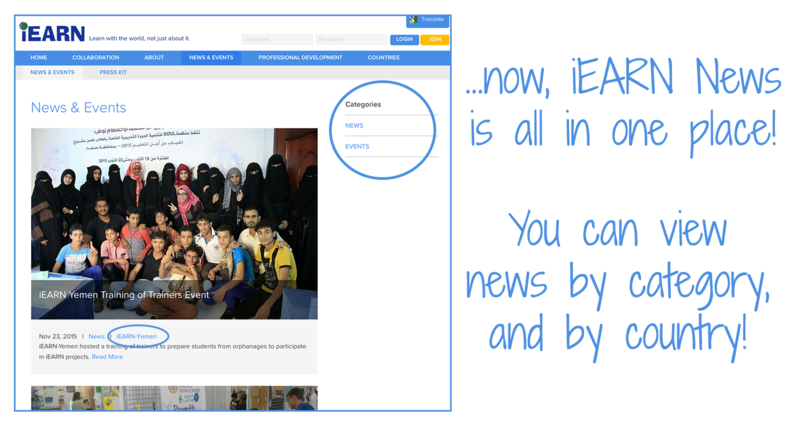 You can now get all the latest iEARN News in one place! Just visit the "News & Events" Section. When visiting this page, you'll see a listing of all the latest iEARN News & Events. You can also browse these items by category by simply using the menu in the right sidebar. Each listed item will outline all the related iEARN Countries. Additionally, you can navigate to the iEARN Country page, by simply clicking the hyperlink displayed with the news item!